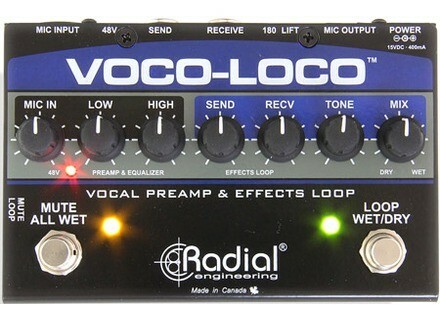 Voco-Loco, Solid-State Pre-amp from Radial Engineering. 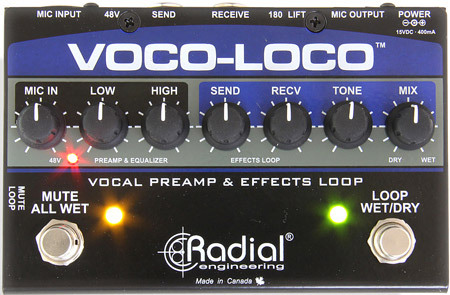 Radial Engineering introduces the Voco-Loco, a mic preamp and effect loop insert that allows singers to add guitar effects. The preamp section delivers 60dB of gain and can be used with any type of microphone thanks to a 48V phantom power. The Radial Accustate level control automatically sets the gain and sensitivity via a dual wafer potentiometer and a two-band shelving EQ lets the vocalist add bass or accentuate the highs to enhance. The signal then feeds an effect loop that has been optimized for guitar pedals via standard 1/4" guitar jacks. Separate send and receive level controls let you adjust the levels going to the pedals. A tone control on the return path can then be used to tame overly bright pedals while the wet/dry blend control enables the artist to mix in as much of the effect as desired. The Voco-Loco's output is fully balanced and able to drive a typical mixing console input. No information about the retail price and availability. More details are expected soon on www.radialeng.com. [NAMM] Drawmer launches a 500 Series Noise Gate Drawmer adds to its catalog the first 500 Serie module which is the DS101 Noise Gate based on the DS201 dual noise gate. [NAMM] Boss TE-2 and DA-2 effect pedals Boss introduces for the Winter NAMM 2013 two new effect pedals, the TE-2 Tera Echo and DA-2 Adaptive Distortion for guitar. [NAMM] Earthworks 1st 500 Series preamp Earthworks will introduce its first 500 Series module, the 521 ZDT mic preamplifier at the 2013 NAMM show this week in Anaheim.